This page will share the solution for Windows Server 2008 users to fix low disk space problem on system partition. Download IM-Magic Partition Resizer Server to increase the size of system partition when Windows 2008 says low disk space alert message. Low disk space issue on system partition frustrated lots of people because they cannot resolve the problem by simply deleting files on the partition. So, the only solution is to increase the size of system partition to fix the low disk space problem. IM-Magic Partition Resizer Server provides a safe way to manage the disk space without touching or hurting the operating system and data stored on the disk. This partition software is specially designed for Windows Server users to resize hard disk when running into low disk space problem. Download, install and run IM-Magic Partition Resizer Server. 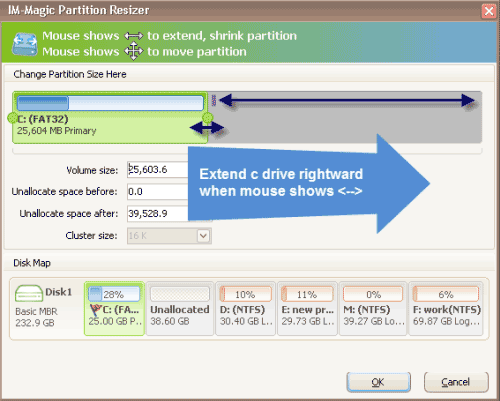 Right click a partition that has lots of free space and choose "Resize/Move" option. 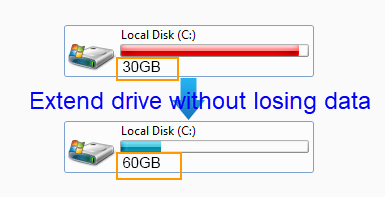 Move the arrows to shrink the partition to squeeze some unallocated space. Move the arrows to increase size of system partition and click "Apply" button. "50GB space on system partition only has about 1GB free space left on my Windows Server 2008 PC. Occasionally, Windows pops up low disk space alert that system partition is running on low disk space. The problem still exists after uninstalling some programs. Somebody online advised me to reinstall operating system and repartition the hard disk to reallocate more space to system partition, but it is a little difficult to me because I don't know how to install system. Is there any easy way to add more space to system partition?" "My system partition on Windows 2008 is running out of disk space. The extend volume option is greyed out under Disk Management. I don't know why but I cannot extend the system partition with all methods I know. How can I increase the size of system partition without reinstalling the operating system?" When there is no free space on a hard disk, you can add a new hard disk to the computer. However, if system partition is running on low disk space, you cannot extend the partition space even if you add a new hard disk because the new added disk space cannot be moved to system partition. Traditionally, you can reinstall operating system and repartition hard disk to reallocate disk space. However, if you don't want to reinstall operating system, you can resize hard disk under Disk Management or with help of third-party partition software. Both Disk Management and partition software can help you resize hard disk without asking you to reinstall system. You can extend partition under Disk Management on Windows Server 2008, but the limitation is that the system only allows you to extend a partition when the unallocated space is right behind the partition you want to extend. Although Disk Management has the function of shrinking volume so that you can make some unallocated space from other partition that has enough free space, it cannot move a partition. Therefore, if you want to extend system partition under Disk Management, you can backup D drive data and then delete D drive. The deleted partition will show as unallocated space behind C drive, so you can add the unallocated space to extend system partition C drive. Professional partition has similar function with Disk Management with a better disk space management. First of all, the partition software enables you to shrink partition to create some unallocated space. Then, the partition software allows you to move the unallocated space close to system partition. And finally, you can move the unallocated space to expand the system partition size. By using the partition software, you don’t need to backup data because it will not touch any data during partition resizing. Windows Server 2008 R2 is Server operating system which has improved its virtualization capabilities and information security and more. Windows Server 2008 R2 is the first 64 byte only Server operating system. If system partition runs on low disk space on Windows Server 2008 R2, the partition software can still work on Windows 2008 R2 to resize the system partition without reformatting the hard disk.